All vacations include transportation from Salmon, Idaho to the river launch site, full camping gear, delicious cuisine, snacks, drinks, including beer and wine, and anything you may need during the rafting trip. For more information on our Lodge to Lodge Trips, please click here. We specialize in working with large groups. Any trip can be chartered by reserving 12 or more seats on the trip. Trips include: Corporate, Family and Kids, Reunions, Women Only, Religious and more. We will help you develop exactly what type of trip you are looking for. Any chartered trip can be either a Camping or Lodge-to-Lodge trip, or combination trip of Camping and Lodge stays. 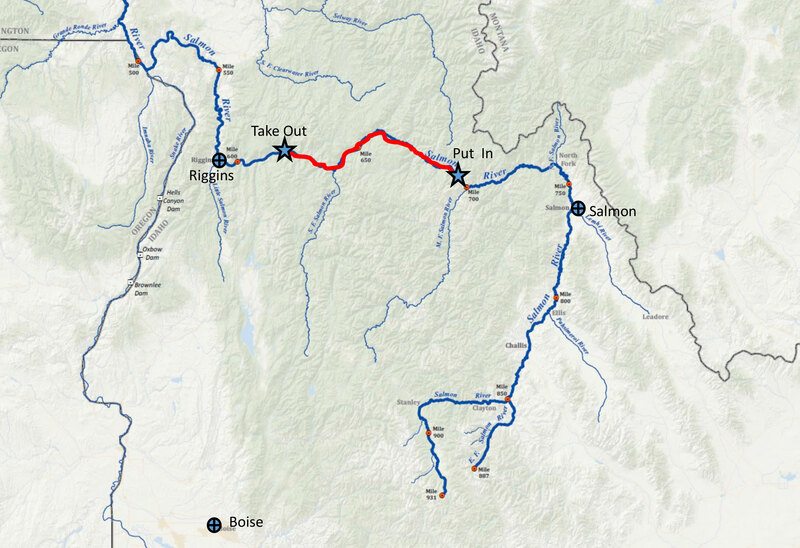 All trips are subject to cancellation due to high water, forest fires, and anything beyond the control of River of No Return Wilderness River Outfitters, Inc.
You will need to arrive in Salmon by at least 6pm the day before your launch date. You will need to attend the pre-trip meeting at 7pm the evening before your launch date. There are a few hotels in Salmon that we can recommend for your stay. Please visit the My Trip page for accommodation recommendations. Salmon, Idaho is a remote area, and there are only a few options to get here. If you are flying in to the area, Boise, Idaho; Idaho Falls, Idaho; and Missoula, Montana are the closest large airports. From Boise, you can take a short flight (45 min) with McCall/Salmon Air or rent a car to drive to Salmon. From Idaho Falls or Missoula, you will need to rent a car and drive to Salmon. From Boise, it is five hours by car and from either Idaho Falls or Missoula the drive is approximately three hours. We will help you make your post-trip plans. This may involve having your car shuttled around to the take-out point or taking a short flight from McCall, Idaho to Salmon; or McCall to Boise. Post-trip transportation is not included in the price of the trip. 1) All clients will be required to follow the safety policies and procedures of River of No Return Wilderness Outfitters, Inc. and the guide’s instructions during activities. 2) All clients will be required to sign a Participant Waiver of Claims and Assumption of Risks Agreement in favor of River of No Return Wilderness Outfitters, Inc. before departing on any trip. 3) Each client agrees and acknowledges when they sign up for a River of No Return Wilderness Outfitters, Inc. trip that they have significant responsibility for their own safety and they agree they are ULTIMATELY RESPONSIBLE for their own safety during participation in activities.